What do Karen’s equine biomechanic lectures include? Karen’s equine biomechanics lectures touch on the fascinating world of equine movement. Her lectures explain to riders the importance of creating and maintaining efficient and healthy posture and movement within their horses. Her lectures are based on biomechanics knowledge gained through lectures and classes with the following international biomechanics experts: Dr. Gerd Heuschmann, Dr. Hilary Clayton, and Dr. Deb Bennett. Karen’s in depth study of their concepts, work, and publications resulted in this visual learning experience, which includes a PowerPoint lecture, an anatomy painted horse, and a moving horse demonstration. The PowerPoint lectures are filled with pictures and diagrams to help beginners to advanced riders understand how a horse moves and how riders affect a horse’s movement. 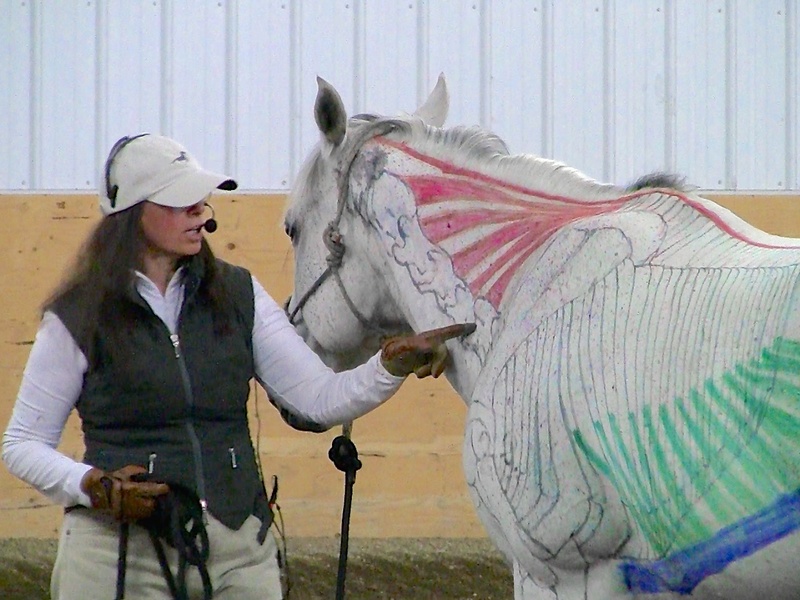 The anatomy painted horse demonstrations help equestrians to see the internal body structure involved in different movements for the horse. This 3-D representation with an actual horse provides deeper understanding of the information learned in the PowerPoint lecture. During the moving horse demonstration, a horse moves through its gaits including lateral work. Footfall, rhythm and tempo of all three gaits are demonstrated. As the horse moves, muscles groups involved in healthy posture are pointed out and how they affect the horse’s movement are explained. Who are Karen’s equine biomechanics lectures for? 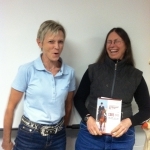 Dr. Hilary Clayton and Karen at Michigan State University Equine Biomechanics class. All disciplines, including dressage, jumping, eventing, western pleasure, reining, cutting, endurance, rodeo, and trail riders, benefit from learning the importance of healthy equine movement to improve their horse’s performance. Those involved in activities such as therapeutic riding, ranch work, outfitting, and dude ranching gain understanding of the importance of healthy muscle development to maintain soundness for their working herds. Equine Biomechanics is lots of fun. Just see how much fun Karen is having at a class by Dr. Hilary Clayton. What is the focus of Karen’s equine biomechanics lectures? It is well documented that efficient and healthy movement is imperative to keeping our equine athletes sound. To prevent lameness and understand a horse’s movement, it is essential to know how and the horses’ musculoskeletal systems function. To perform to its highest level of potential, the horse needs to be encouraged into a ‘healthy frame’ or ‘position’ that allows it to develop the necessary muscles for balance and throughness. When these muscles have been developed, the equine athlete will be able to enjoy moving freely without injury for many years. Riders have good intentions; none intend to cause lameness in their horse. Rider induced lameness is usually caused by a rider’s lack of exposure or awareness of the horse’s anatomy. 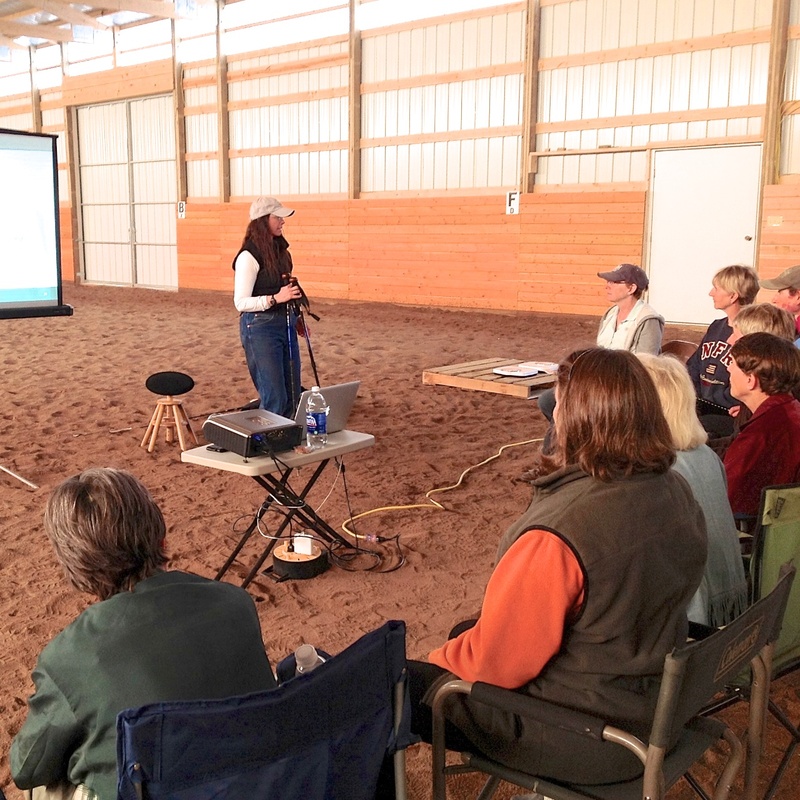 Karen incorporates classical and natural horsemanship training methods into her biomechanics presentations. She addresses the horse’s posture and how different training methods can help enhance a horse’s physical and mental well-being.